Thank you to those of you who commented last week when I floated my idea for Sunday Smiles, my new blog feature – it was encouraging and uplifting, and you guys are the best! So I’m going to carry on with Sunday Smiles, and I’ve decided to make a little logo icon thingy for it (helloooo excuse for procrastination). Before I launch into this week’s list of things that I enjoyed, discovered and that made me smile, I should mention that the Olympics Opening Ceremony hasn’t made the list because I haven’t actually watched it yet – due to the time difference, it was on at 7am here and getting up at that time on a Saturday wasn’t such an attractive option, and I figured it would be available to watch again online. It turns out that you need a Sky subscription to watch it again online though, so hmmmm… Bummer. I’m hoping somebody at the lab will have a solution for me tomorrow. Fingers crossed, because I’ve heard amazing things about it. Another entry thanks to the NZIFF – I also saw Entre les Bras/Step up to the plate (trailer here), which was about the handover of the family hotel-restaurant from celebrated chef Michel Bras to his son Sébastien. It was so good to hear French spoken (even if it was with a strong Southern French accent, which I always find amusing) and see such beautiful and mouth-watering food. It made me miss France and good cheese though, not going to lie. 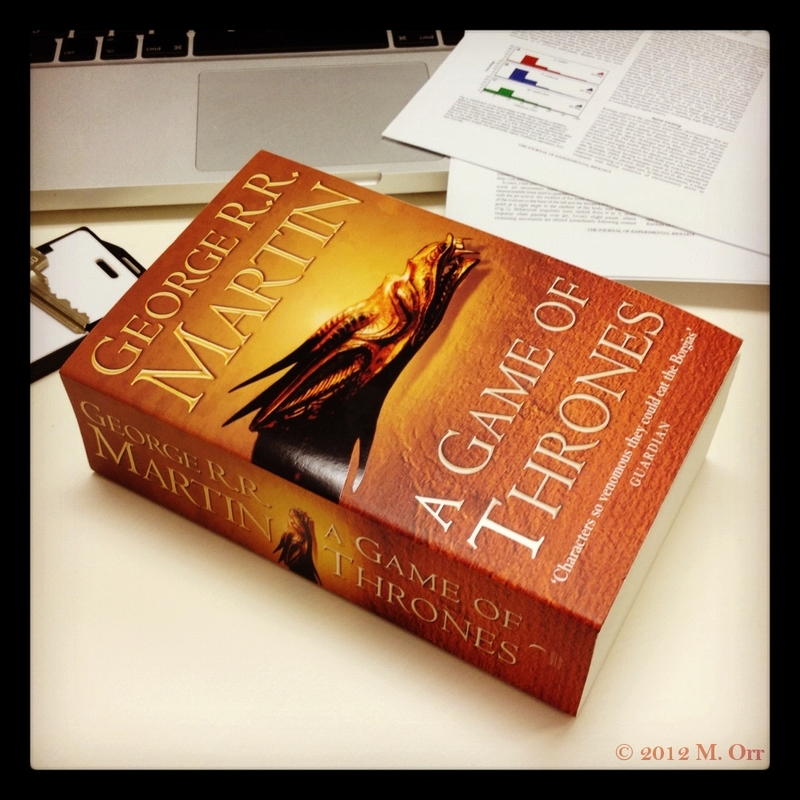 Finally, I got to my desk on Friday to find A Game of Thrones (the book) sitting on my desk. Best surprise ever. I’d mentioned a few days previously that I really wanted to read the books but the library waiting list is massive, so I’m still (impatiently) waiting for a copy and one of my labmates had the same issue, so he ended up going out and buying the book and let me borrow it. It’s just as addictive as the TV series, and I’m already 150 pages in… Only 650 to go (it’s the paperback version and actually the size of a brick, though thankfully not as heavy). 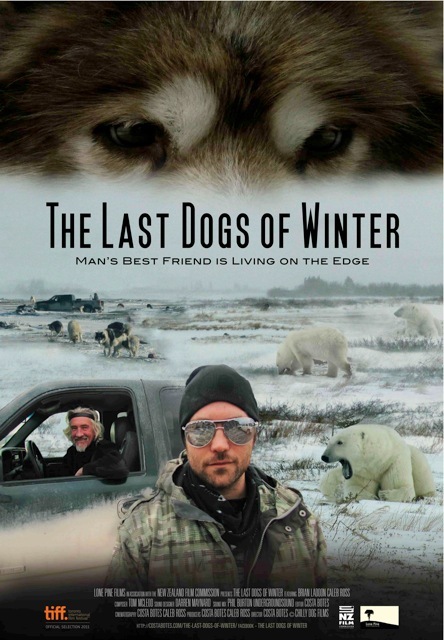 I’m thoroughly enjoying it, even though I know what happens, and it’s interesting to discover the little differences between the book and the TV series, though nothing major so far. What made you smile this week? PS – For next week, I’ll work on being a little more concise (not one of my life skills, in case you hadn’t noticed). 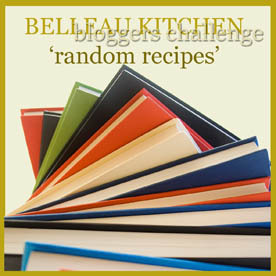 For this month’s Random Recipes challenge Dom has changed things up a little and asked us for “something a little different.” The whole concept of Random Recipes revolves around every participating blogger’s respective collection of recipe books, and whilst there’s no cooking involved this month, the recipe books themselves get to be the stars of the show post. Dom wants us to take a photo of our cookbook collection, perhaps feature a couple of our favourites, or share the stories behind some of them. I think this is an excellent idea, mostly because I’m rather nosy and I like knowing what the homes of bloggers that I follow regularly look like, so then as I read their posts I can picture them in their environment and better imagine the stories they tell. Is that creepy weird? You won’t be surprised to read that I’ve enjoyed seeing other bloggers’ entries pop up. Not only because of my general nosiness but because I’m pretty sure this is the first time that I can describe myself as ‘restrained.’ (Anybody who knows me in real life is probably laughing at the idea of me showing restraint.) Whilst I frequently browse the cookbook section in bookshops, there’s such an overwhelming choice that I can usually never decide on just one and end up going home empty-handed. My single shelf of books probably makes me a contender for the smallest collection of cookbooks amongst the Random Recipes participants. 25 magazines waiting for me to file away the recipes that interest me… I should probably get onto that. I’m terribly OCD about alphabetising things (having a librarian as a mum probably had an impact), but cookbooks are my one exception – I organise them by height, because it’s more aesthetically pleasing. And some don’t have named authors, so then it all gets terribly complicated. With only 23, it’s pretty easy to find the one I’m looking for anyway. Incidentally, a word about the rest of my bookshelf – aside from my cookbooks, I left most of my other books (fiction and other non-fiction) in Edinburgh and since books take up a fair bit of space are thus expensive to cart around the world, I’m trying to avoid buying any whilst I’m here (thank goodness for libraries! ), hence the dearth of other books. 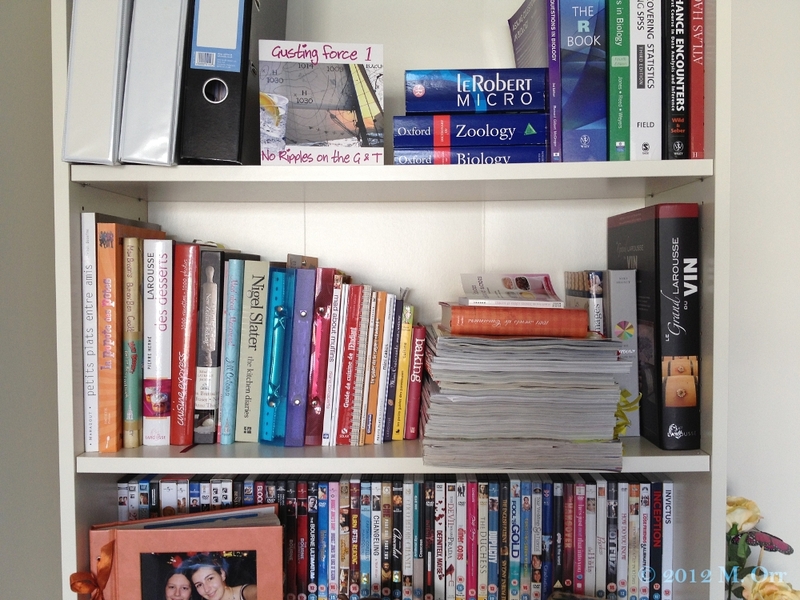 As well as that, a lot of my uni-related books and folders live at my uni desk rather than at home. I think my favourite book has to be my copy of Larousse des desserts, a (brilliant) gift from my French aunt and uncle and a bible of all things dessert-related. 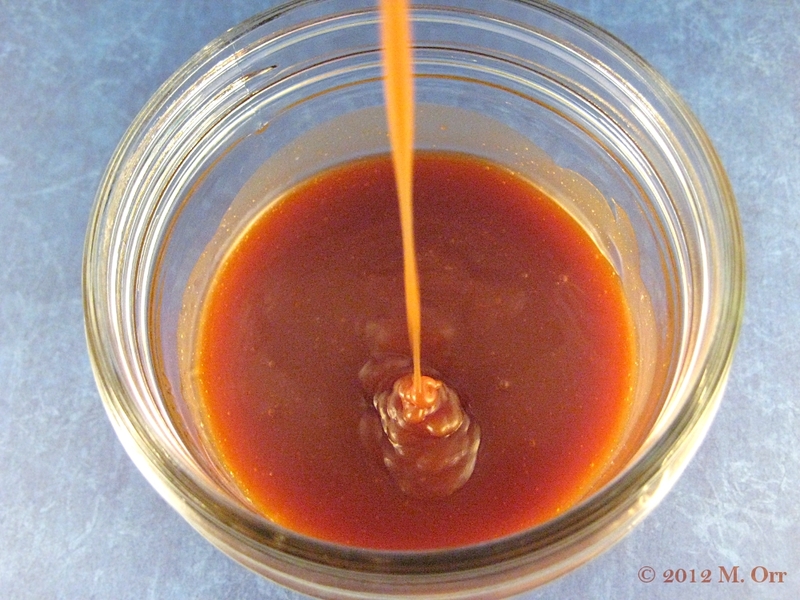 I frequently turn to for tips, techniques or just simply ideas, as well as when I’m unsure about a recipe from another source, and aside from the caramel sauce saga, it has never let me down. If you’re looking for an all-encompassing dessert book that ranges from pastry to cakes to pastries to chocolates to elaborate desserts, and speak French, then I highly recommend this one! I was given several student cookbooks before I went to uni, and since they were from my mum and my French aunt and uncle (they give the best gifts), they’re all French. I’ve flipped through various British cookbooks aimed at students, but they really don’t measure up – as a general rule, they all seem to be over-simplified and aimed at students who can barely even cook pasta. Books for students who already have some cooking skills and are just looking for cost-effective but tasty and, importantly, healthy meal ideas seem to be pretty few and far between. 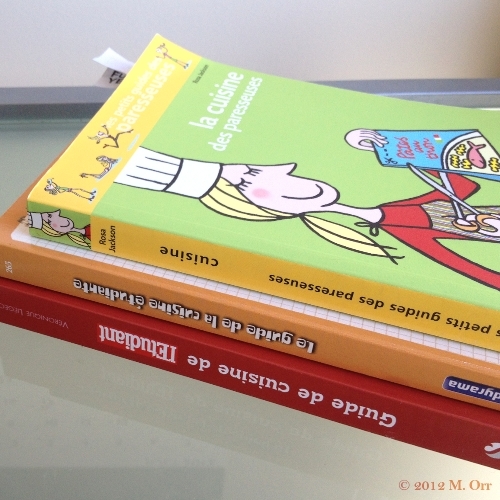 Student cookbooks in France, however, suit me perfectly. I still regularly refer to these books for meal ideas, as well as simple and straightforward everyday desserts. 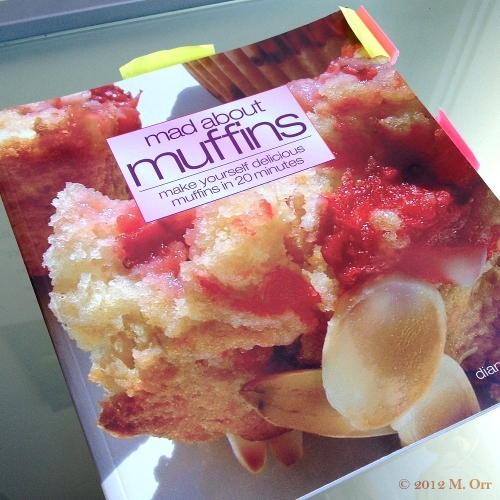 I also have to mention my well-thumbed and slightly batter-splattered copy of Mad About Muffins. I’ve tried over half of the recipes from this book, most of them more than once, and I’ve yet to be disappointed. If you’re looking for a dedicated muffin book, this one is definitely worth consideration. I’d actually really like two comprehensive books about meat, one in French and one in English because the cuts are different between the two countries and so is what you do with them. The same goes for fish. I’m also looking for a good vegetarian cookbook because I struggle to come up with interesting main courses when inviting vegetarians over. Any recommendations are welcome! Since I really enjoyed the TV series and the book seems pretty comprehensive, I’ve requested River Cottage Veg Everyday from the library to give it a test-run, so we’ll see how that goes. Whilst we’re on the whole behind-the-scenes thing, for those of you who are as nosey as I am, I thought I’d include a photo of my little kitchen here in NZ, complete with totally pointless dishwasher (although I guess it does make a pretty good drying rack). I’ve probably moaned about not having much counter space… I haven’t been exaggerating. At least I have a fair bit of cupboard space, although one of the cupboards is taken up by a microwave, and the rest are full. I might not have that many cookbooks, but I have a hell of a lot of kitchen paraphernalia. I don’t, however, have a proper utensils pot, because I have yet to find one that jumps out at me. 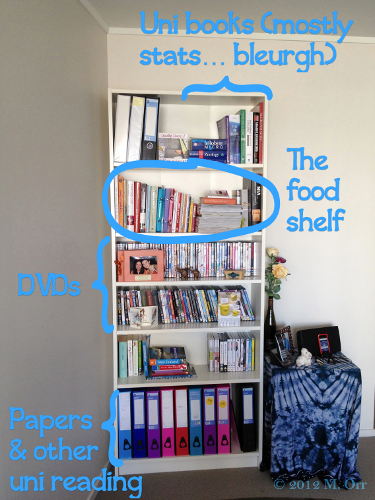 So there you have it, a little sneak peak at my cookbook shelf and kitchen. 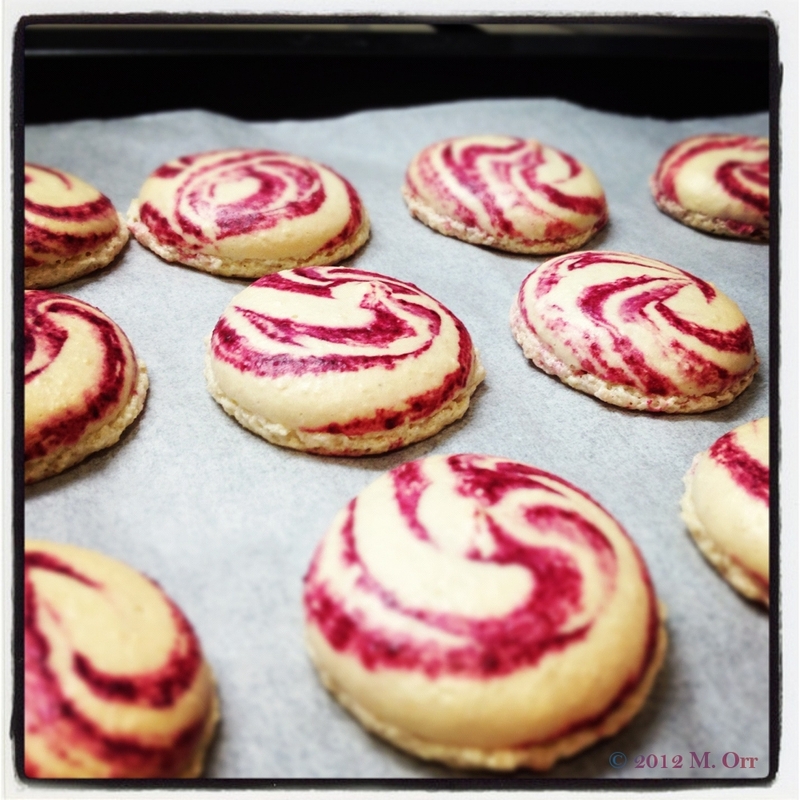 If you read my Sunday Smiles post, then you already know that today’s post features swirly-shelled macarons. You also know that these macarons are my entry to two different blog challenges… The random letter for this month’s AlphaBakes challenge, which is being hosted by Caroline Makes, is “W” and upon reading that, I immediately thought of white wine. This month’s We Should Cocoa challenge is being hosted by Choclette at the Chocolate Log Blog, and she has chosen “blackcurrant” as the special ingredient, which are very much not in season here at the moment. This was minorly problematic for all of about ten seconds until I my eyes settled on my bottle of crème de cassis, which is a blackcurrant liqueur. 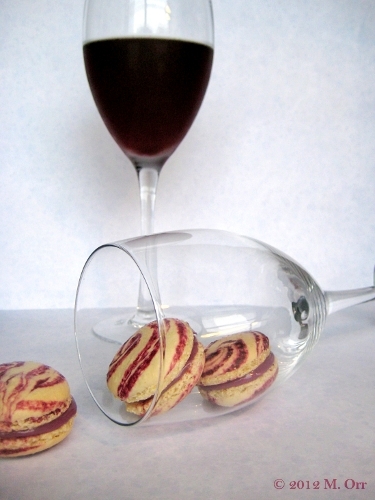 White wine and crème de cassis… The stars have aligned and I have been presented with a kir… Recipe challenge win. I’m not sure how well known kir is outside of France. 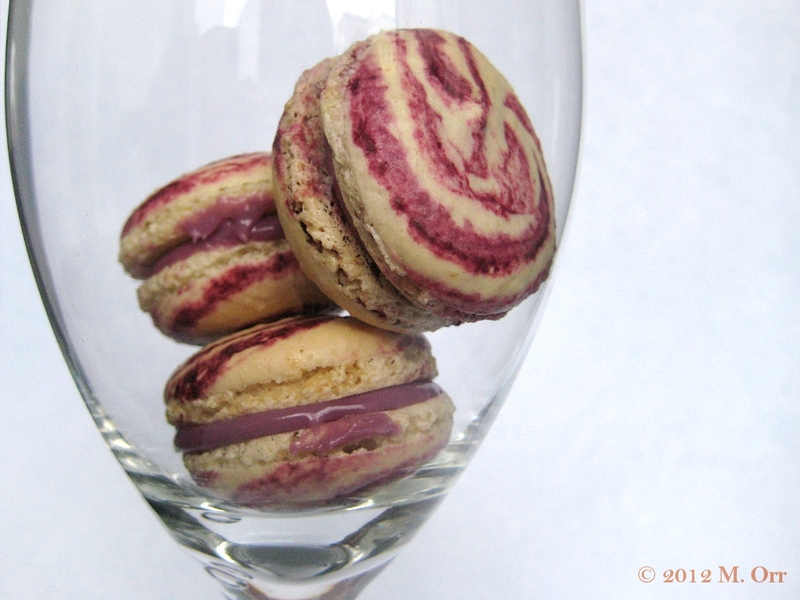 Phil from As Strong as Soup correctly guessed that today’s macarons involve crème de cassis (well done Phil! ), and also mentioned kir in his comment, but I gather he’s spent a fair amount of time in France, so he might have a bit of an advantage. I feel that kir royale – champagne with crème de cassis – might be a little better known, and kir is basically its forebear (I think). Now kir is technically supposed to be made with Bourgogne aligoté (a Burgundy made with aligoté grapes), but I doubt it’s particularly easy to find outside of Burgundy, and so I’ve always made do with whatever white wine I happen to have. Incidentally, if you’ve got some white wine that’s a little past it’s best or that perhaps didn’t taste as wonderful as you expected, adding some crème de cassis vastly improves matters (there are limits however… Wine so much past its best that it’s turned to vinegar or Tesco Market value “wine” are both far beyond the help of crème de cassis). I was a little heavy-handed with the crème de cassis when I was made the one in the photos (woops…), so it’s not usually quite as dark. 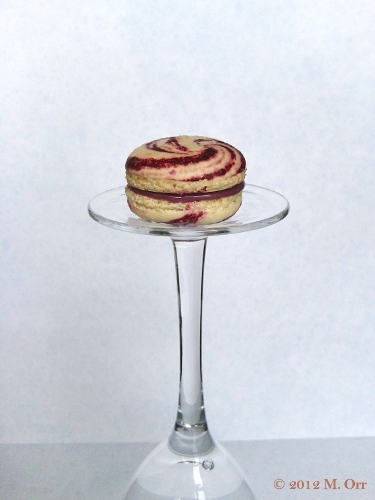 So far, I’ve found that best way to transform a cocktail into baked goods is in the form of macarons… I might even go as far as saying that it’s one of my specialities. 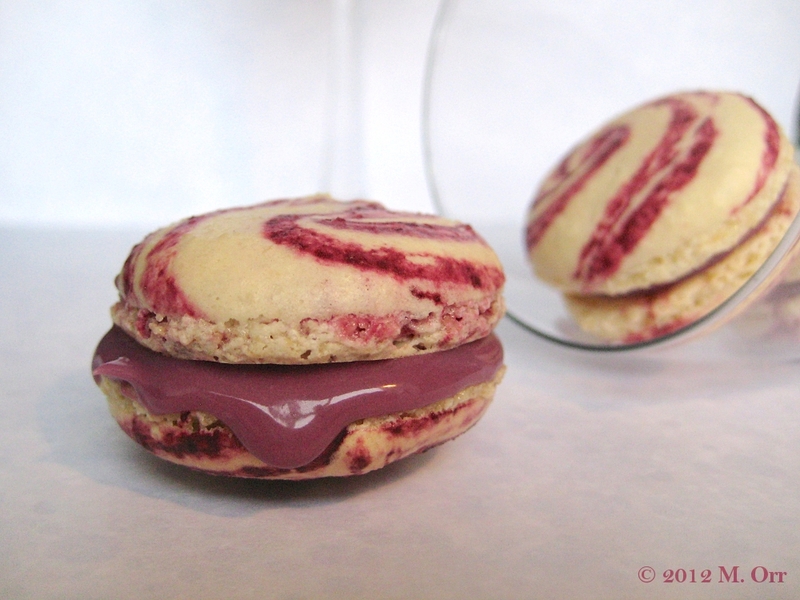 Kir macarons were a no-brainer, and I knew since the beginning of July exactly how I was going to make them, right down to the swirly shells, and the exact proportions of the ganache – I went with a white chocolate base (which also starts with W – do I get bonus points for AlphaBakes?) and a 1:2 ratio of crème de cassis to wine – but I just had to find the time. 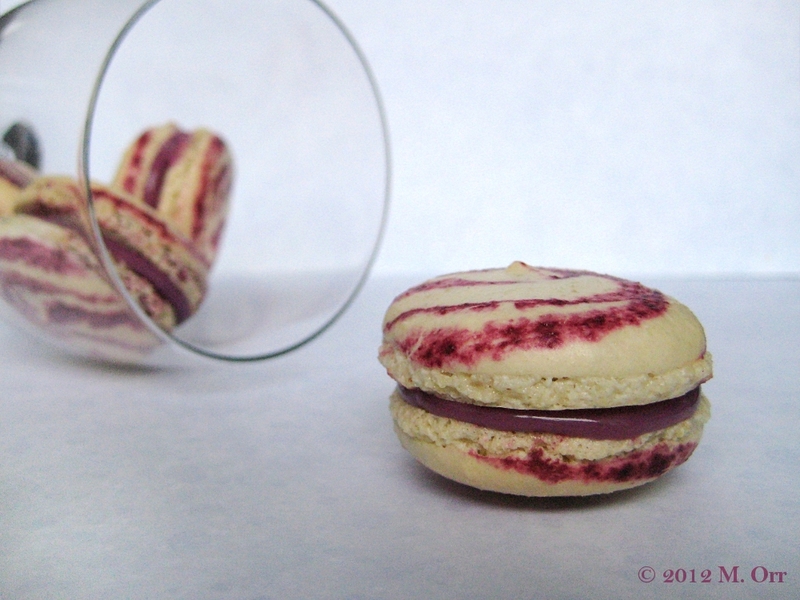 I love macarons, and I enjoy making them, but they are time-consuming. I finally tried them this weekend though, and boy were they worth making the time for. I was a little nervous because this was the first time I’ve tried macarons in my oven here, but they worked well. The feet could have been a little more developed, but that’s more of a macaronnage issue than an oven issue – I guess my technique is a little out of practice. I’m really happy with the swirly effect though – I’d never tried it before, and I love how they turned out! I’ll definitely be playing around with that again. The white wine flavour is more of a very subtle undertone and doesn’t quite cut through as much as it would in a kir, but that was a deliberate choice on my part since I love the flavour of crème de cassis. 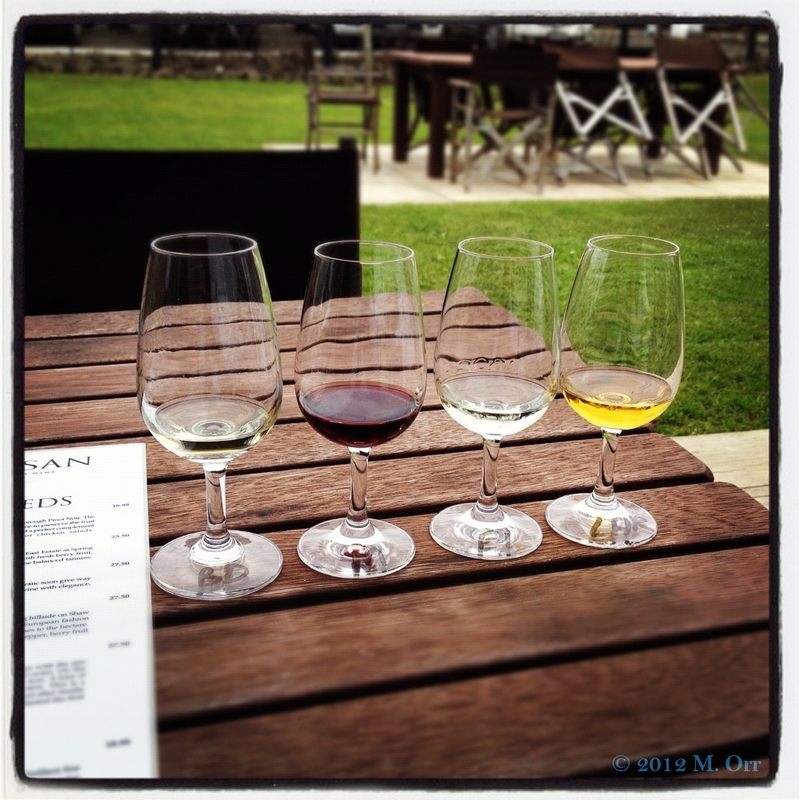 If you want more wine flavour, you can just adjust the ratio of the two alcohols to your personal taste. These are quite strong on the crème de cassis flavour – if you’d prefer a stronger wine flavour, then just adjust the ratio of crème de cassis to wine, ensuring that the total amount of alcohol doesn’t exceed 45g max (otherwise the ganache really won’t set). 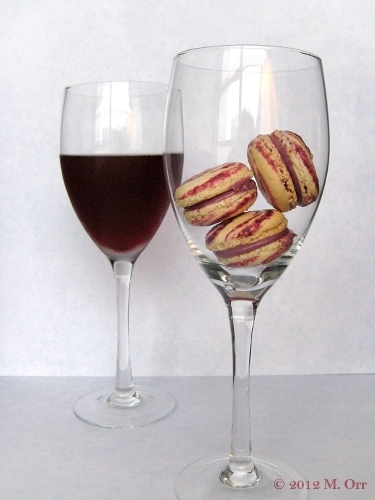 The macaron shells and the white chocolate in the ganache are already very sweet, so choosing a wine that will cut through the sweetness is ideal. Make sure you leave these at least 24h before eating them, in order to allow the ganache to soak into the shells a bit. They’re best stored in an airtight box in the fridge – just remember to bring them out at least 30mins before eating them, so that you can appreciate the flavour fully! 1. Line three or four flat baking sheets with baking paper and set aside. 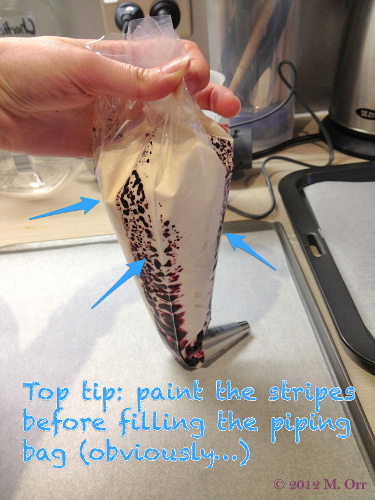 Prepare a piping bag with a plain round piping tip. 3. 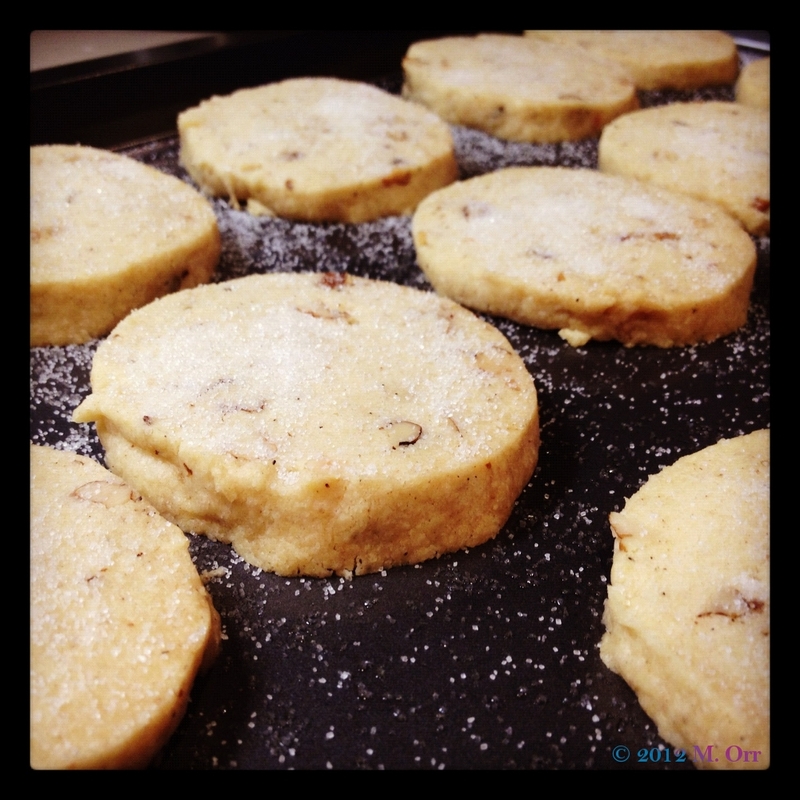 Blend the icing sugar and ground almonds together (don’t skip this step!). Sift them through a medium sieve into a large bowl. Sift them again if necessary. 4. Make the French meringue by whisking the egg whites into glossy firm peaks, gradually adding the caster sugar. 6. Transfer the mixture to the previously prepared piping bag and pipe out the desired size of rounds (mine were about 1.5-2cm in diameter). Press the nozzle right down on the paper and finish off with a flourish to obtain a nice round. Leave a good space between them so they can spread out. 7. Leave to set for about 30 mins (this helps to produce the feet). Preheat the oven to fan-oven 160°C. When you can feel that a skin has formed over the top, they are ready to go into the oven. 8. Bake one tray at a time in the centre of the oven for about 8-10 mins (to see if they are done, touch the top – if there is a “wobble,” leave them in 2-3 mins longer). Leave them to cool on the baking trays, and when they are completely cool, carefully remove them and pair them up by size. 9. Whilst the macarons are setting and cooking, make the ganache filling. Heat the cream, and as soon as it starts boiling, add the white chocolate (broken into pieces), the white white wine, crème de cassis and a few drops of purple or pink and blue food colouring paste (the food colouring is optional, but adds a bit of fun colour), and mix with a wooden spoon until smooth (don’t let it boil or you will boil off the alcohol and we wouldn’t want that now, would we?). Allow the mixture to thicken in the fridge (or freezer if necessary). PS – Apologies for the super long and rambly post… Well done if you made it all the way to the end!! I have a confession (and it’s a bit of a heavy one). I’ve been feeling a bit miserable lately. And by lately I really mean a few months…or even the past year. I’m thoroughly fed up of always feeling down, but I can’t seem to shift it. Of course it fades when I’m out having fun, doing things I love, like visiting the zoo, or watching the All Blacks, but it’s only temporary and I know that the feeling will be back the next day, which is frustrating. I’ve tried not to make it noticeable in my blog posts, but I’m not sure how well I’ve succeeded. 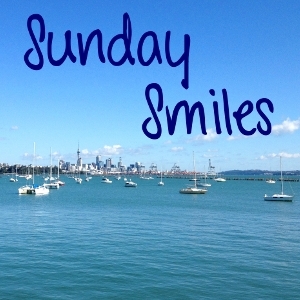 Anyway, in a vague attempt to improve things, I’ve come up with a new blog feature: Sunday Smiles. It’s a simple and straightforward idea – basically I’ll list some of the things that have made me smile over the past week, whether they’re new discoveries, things I’ve read, or just pretty things I’ve seen. I guess it’s similar to the “Friday Favourites” lists that I’ve seen on a few blogs (but since I tend to post a recipe on Fridays, that doesn’t really work for me). The point is basically to focus on good things, happy things. Oh, and I’ll post it every Sunday. See? Simple! 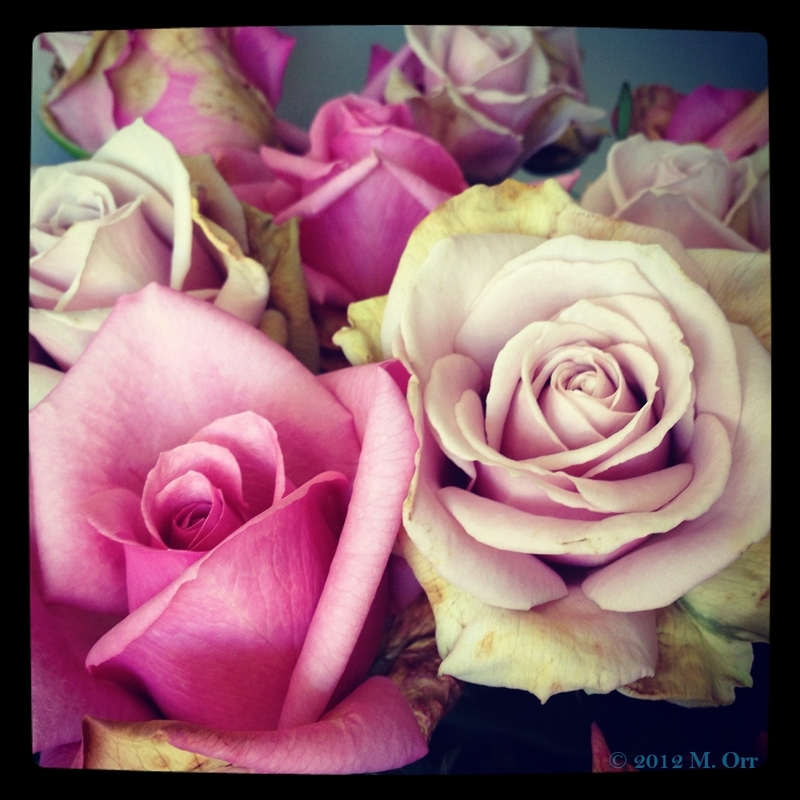 Do let me know what you think – good idea or not really that interesting and rather self-indulgent? When I arrived in New Zealand, I was surprised to discover that sweet potatoes were actually a staple in the Māori diet before the arrival of European settlers. Consequently, they remain popular here and although it seems that the traditional kumara varieties have mostly been replaced with imported varieties that grow bigger and produce more, they are still referred to by their Māori name, kūmara (pronounced KOO-mah-rah). Orange kumara seems to be the same variety as orange sweet potato that you find in the US or Europe, but we have two other varieties here that I don’t think I’ve seen before: red and golden. The three varieties differ slightly in their flavours and their levels of sweetness, with orange being the sweetest (and mushiest when cooked, it seems), and red the least sweet. 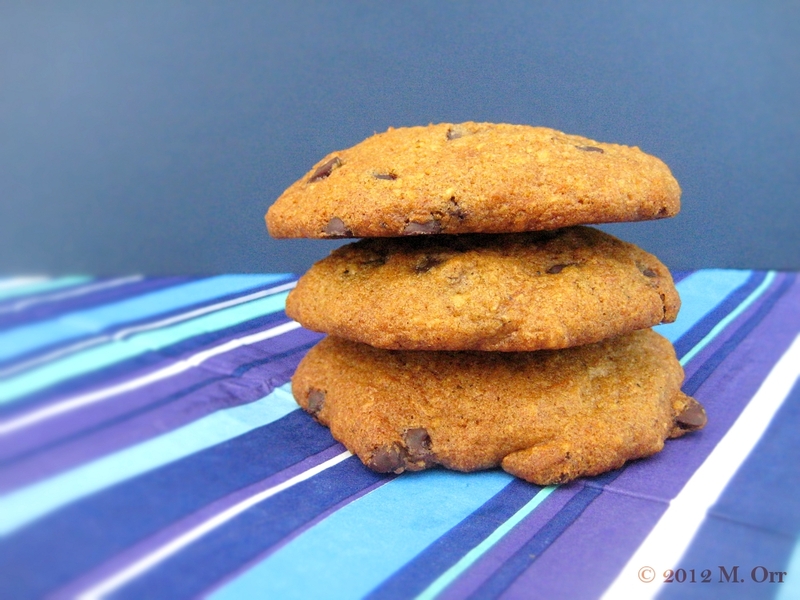 Aside from their secret ability to blow the socks off Kiwis, these cookies are delicious in their own right, and the orange kumara gives them a lovely orange tinge as well. They’re lovely and soft and pillowy and fantastically moist, so actually, I feel cookie might be a bit of a misnomer since their texture reminds me more of cake than a traditional cookie. It’s very much like eating cake in the shape of a cookie. I’m a fan. Although I can’t help but wonder if there should be an alternative name for them – cakies or cakelets or something. Any thoughts? 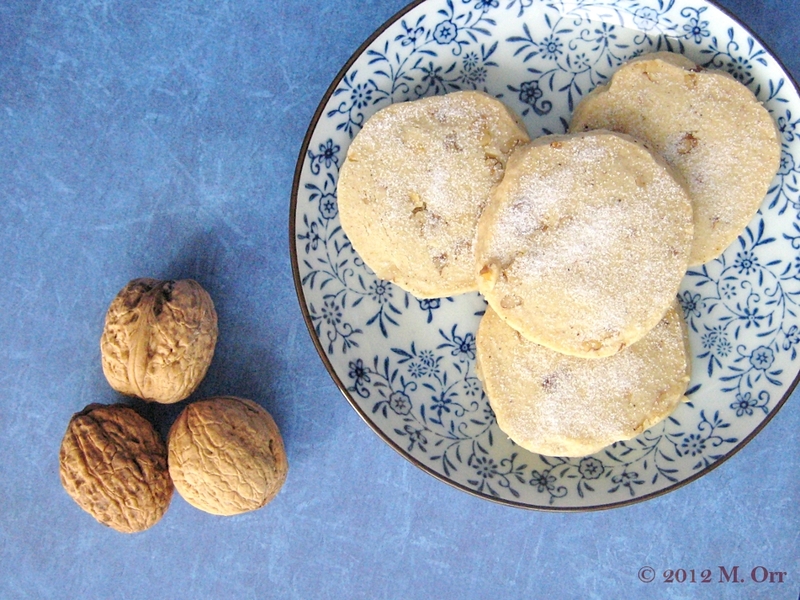 Although kumara are perpetually in season (in NZ anyway – in Europe I always thought they were in season through winter), the spices make me associate these cookies with winter: cinnamon, nutmeg and cloves. Definitely a fabulously wintery combination, and one full of flavour at that! These cake-like cookies are wonderfully soft and pillowy, not crunchy as you might expect from a cookie. 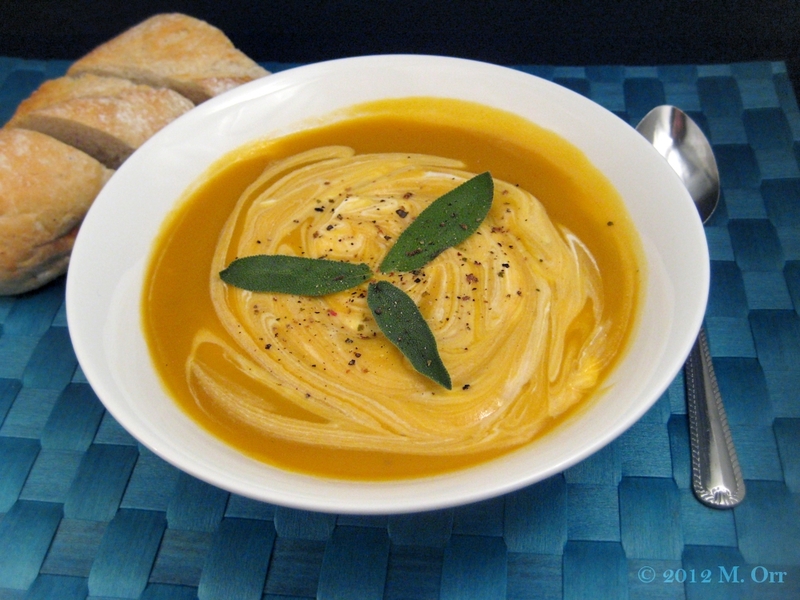 The kumara/sweet potato taste really does shine through, as do the wintery spices. 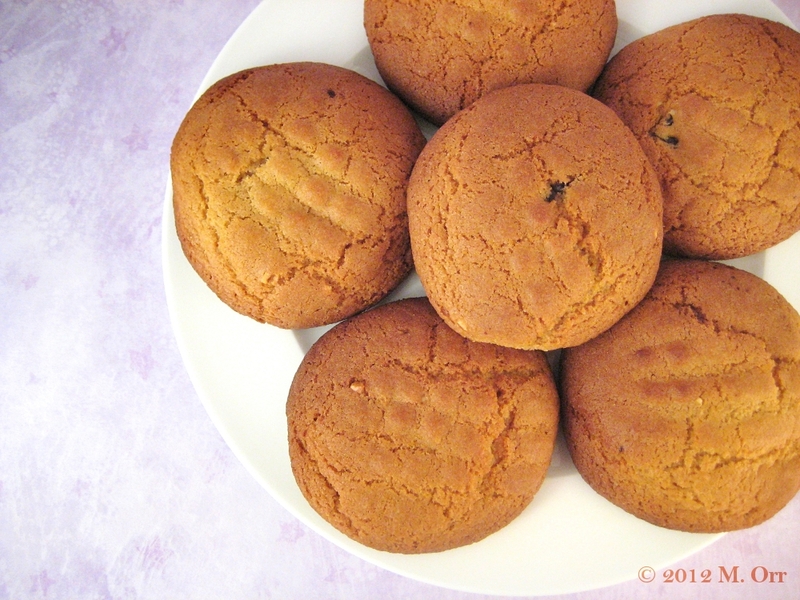 Make sure to use orange kumara as they are the sweetest and mushiest, so perfect for baking, and they also give the cookies their slightly orange colour. The cookies will keep for up to 4 days in an airtight box. Since they’re quite soft, place a sheet of baking paper between layers to prevent them from sticking together. 1. Preheat the oven to 205°C. Line a baking tray with baking paper. 2. Scrub the sweet potato and pierce the skin with a fork. Place on the baking tray and roast for about 40 mins until there’s no resistance when a knife is inserted through the thickest part. Remove from the oven and allow to cool until it can be handled. Peel the skin off and roughly mash the flesh in a small bowl with a fork. Set aside. 3. Reduce the oven temperature to 175°C. Line two baking trays with baking paper. 4. 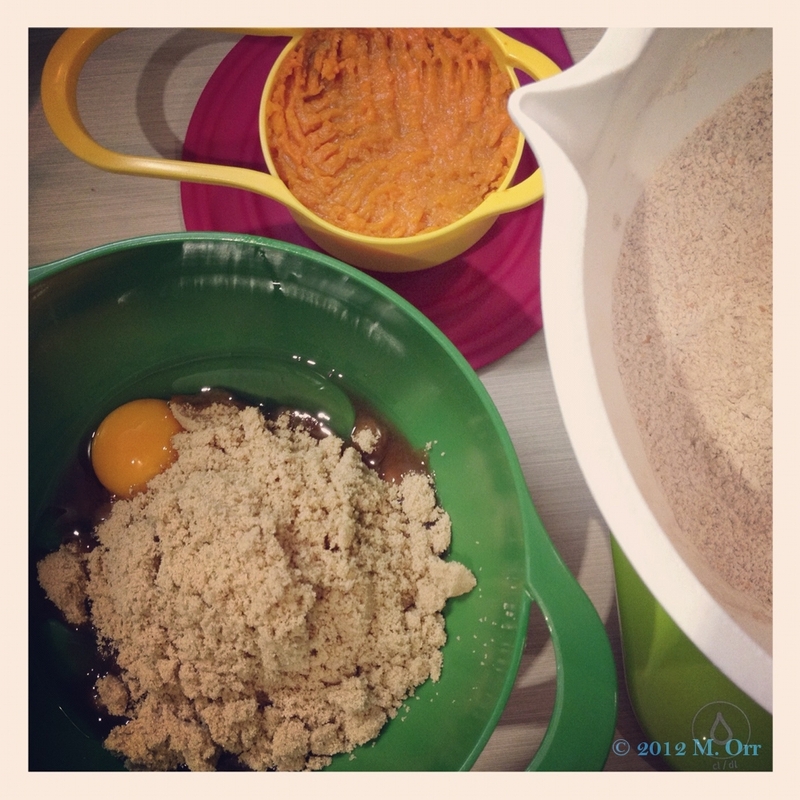 In a medium bowl, whisk together the light brown sugar and egg until pale and thickened (it will get pale, I promise – it just takes a bit effort if doing it by hand, as I did – see the photo below). Gently whisk in the oil and vanilla, then fold in the kumara. 5. In a large bowl, mix together the two flours, baking powder, baking soda, cinnamon, cloves, nutmeg and salt. Add the kumara mixture to the flour mixture and fold together with a spatula until the flour is no longer visible. Fold in the chocolate chips. 6. Scoop up heaped tablespoons of cookie dough and deposit on one of the prepared cookie sheets, as neatly as possible. Space the heaps of dough about 5cm apart. Bake for 10-12 mins until risen and a toothpick inserted into the centre of a cookie comes out clean. Remove from the oven and leave the cookies on the trays for 10 mins before transferring to a wire rack to cool completely (they’ll still be quite soft so be careful). PS – I know I said the kumara gives an orange tinge, but not quite as much as the photo above – that rather over-emphasised colour is courtesy of my minor Instagram addiction (you can find me under sharkyovengloves). Cocorico! C’était le 14 juillet! Saturday was the 14th of July, France’s national day, or Bastille day as it seems to be called in English. In French, we just call it le 14 juillet, and it is, obviously, a day of national celebration. This post was actually planned for Saturday, but my photo editing program decided to go on strike, presumably in honour of France, so that obviously didn’t happen. But today’s recipe is worth the three-day delay (and pre-recipe rambling), I promise. Whenever we spent le 14 juillet in France, my main memories are of food, followed by fireworks. Always a winning combination. Ordinarily, I’d have probably thrown a dinner party for le 14 juillet, but aside from the minor logistical issue of only having a tiny dining table with a grand total of two chairs, one of my labmates was having a birthday party in the evening. I also had a friend staying for the weekend, and we had various things planned, resulting in a busy but thoroughly enjoyable weekend, which included discovering a new farmers’ market and a wine tasting (always a win). The closest we got to something specifically French-oriented was going to see a so-dreadful-it-was-hilarious stage version of ‘Allo ‘Allo. My other little nod to le 14 juillet was my party contribution in the form of madeleines (which are not the subject of today’s blog post… apologies if you got your hopes up there!). 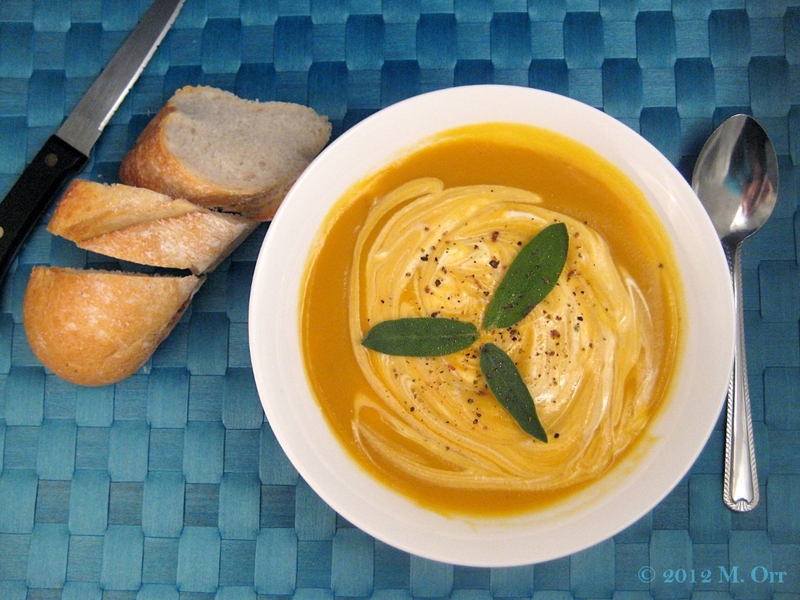 However, if I had been hosting a 14 juillet dinner party, I’d have made soup for starters (remember it’s winter here), specifically sweet potato and pear soup, which isn’t especially French, but is utterly delicious. This is actually one of my favourite soups, because it’s wonderfully smooth and creamy, which I adore. 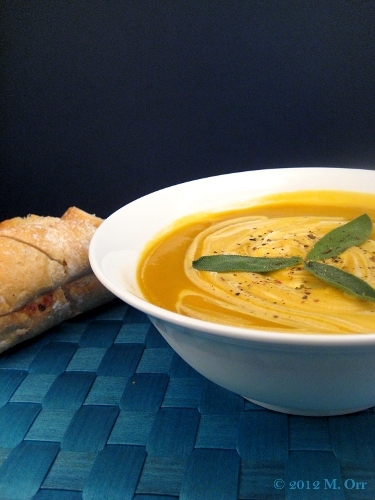 The combination of sweet potato and pear may sound a little strange, but it results in a very refined flavour, making this soup a perfect dinner party starter, with the added bonus that it can be prepared in advance. It’s so delicious that it would be a shame to restrict this soup to just dinner parties though, particularly since it’s so easy to make. In fact, this was the soup that Kat and I had after spending several hours in the snow queuing for Christmas Ball tickets and discussing my idea to start a blog. Certainly not a dinner party, but definitely what we needed to warm up on that wintery day! 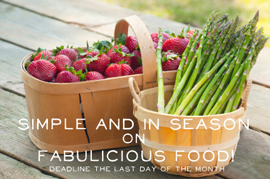 Since sweet potatoes and pears are currently in season here in NZ, this is my entry to this month’s Simple and in Season blog event, which was started by Ren at Fabulicious Food, and currently hosted by Homemade by Fleur. Make sure you blend the soup to within an inch of its life, because this soup is all about the smooth creaminess, which is what makes it feel quite light. If the soup is too thick for your liking, just add a little bit of water and mix well before adding the cream. This soup freezes really well – freeze at the end of step 4, before adding the cream, and then once defrosted, heat the soup up and just add the cream right before serving. 1. Dice the onion. Peel and dice the sweet potatoes and pears. 2. Sweat the onion in some butter in a large saucepan or pot for a few minutes, but don’t allow it to brown. Add the sweet potato and pear and allow to cook for about 5 mins, stirring often. 3. Add the vegetable stock (if you don’t have any, you can just use water) and bring to the boil. Cover and simmer for about 20 mins. 4. Remove from the heat and blend until perfectly smooth. Season with salt and freshly ground pepper and return to the heat if necessary. 5. Swirl a big spoonful of crème fraîche into each bowl and garnish with a couple of sage leaves before serving. Enjoy and I hope you had a wonderful 14 juillet! There’s something about seeing boats and the sea that always soothes me, whether the sea is calm or stormy, and if I ever feel a bit down and just need to get outside, I tend to seek out a view of the ocean. This was easy enough in St Andrews, where there was only a squat church and some rather high cliffs that separated the end of my street and the sea. I was spoilt – there were plenty stunning sea views around town, and most of them no more than a 5 minute walk from my flat, if that. Here in Auckland, I’m not quite as lucky, but the Viaduct harbour is a 15 minute walk from my flat, and full of beautiful yachts, so I can’t complain too much. This weekend I happened to be near the harbour as the sun was setting, so I headed over for a wander around (incidentally, there are restaurants and bars around the harbour, so there are always people around and it feels quite safe to hang around even in the evenings). I hadn’t realised that I’d been feeling quite so down until I got to the harbour and watched the sun set over the gorgeous yachts. Feeling more at peace (and having satisfied my Instagram addiction for the day), I headed home and baked, just to reinforce my improved mood. I find the process of creating something scrumptious out of butter, flour, sugar, eggs and a few added extras really therapeutic (well, when it works… which isn’t always the case). The only problem with baking to cheer myself up is that, whilst I do have a sweet tooth, there’s no way I can eat an entire batch of cupcakes or a whole cake all by myself before they go stale (except that Greek yoghurt and honey cake, which provided me with breakfast for several days, thanks to the syrup that kept it moist and flavourful). Luckily the issue is easily solved by bringing surplus baked goods into the lab, and they get polished off rather quickly. 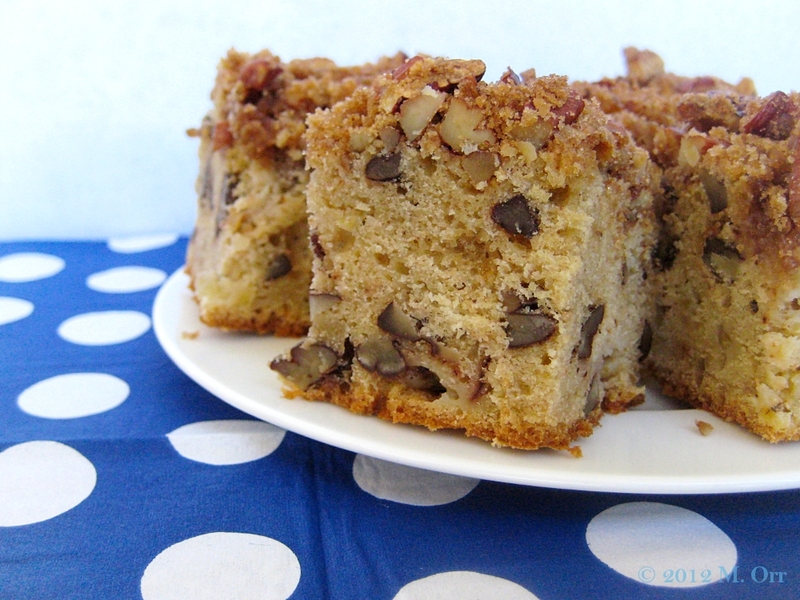 This cake makes a wonderful afternoon snack, accompanied by a cup of tea or coffee, and is delicious served both warm or cold. 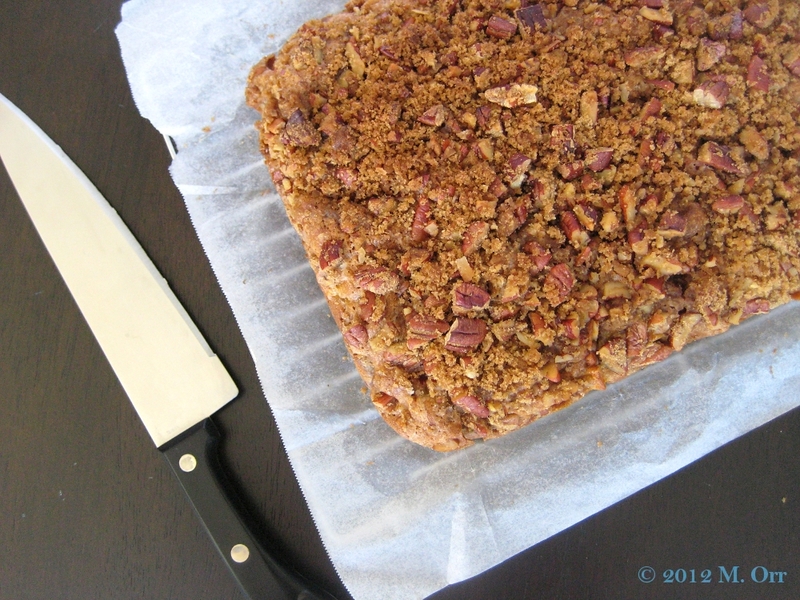 It would also work very well with walnuts instead of pecans (the original recipe actually uses walnuts). The cake will keep for a few days in an airtight container. 1. Line a 22 x 30 cm baking tin with baking paper (or if you don’t have such a large tin, use a 19 x 25 cm baking tin and a 9 x 20 cm loaf tin). Preheat the oven to 175°C. 2. 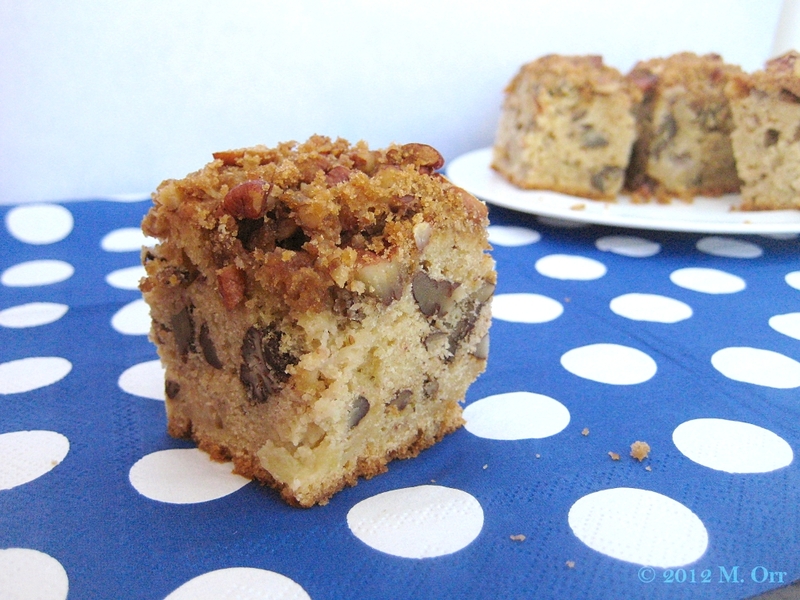 Prepare the streusel topping. Roughly chop the pecans and mix them together in a medium mixing bowl with the sugar, cinnamon and salt. 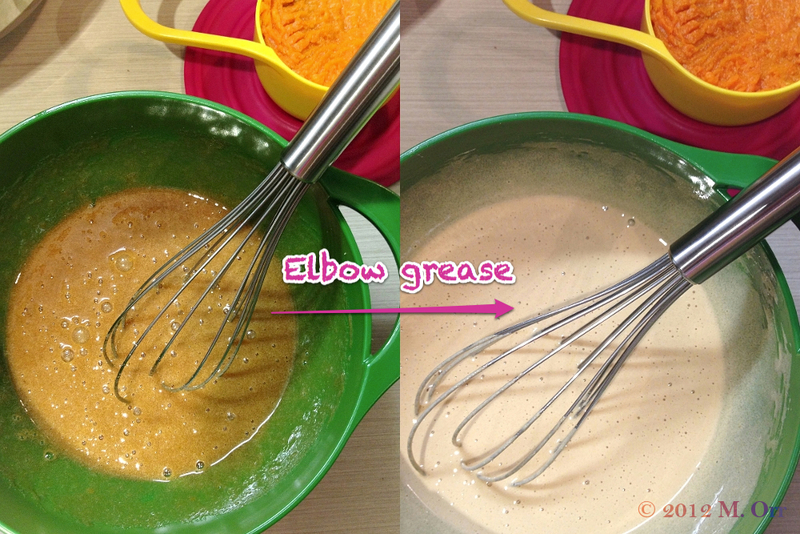 Rub the butter into the mixture with your fingertips until crumbly. Set aside. 3. In a small bowl, combine the two sugars for the cake. In a medium bowl, stir together the flour, baking powder, bicarbonate of soda, cinnamon and salt. Set both aside. 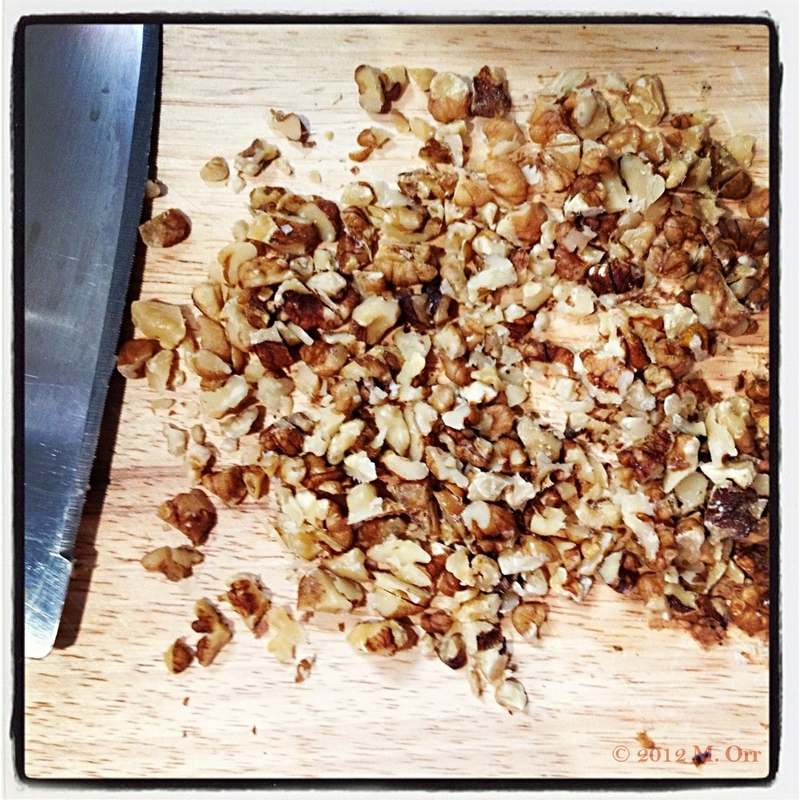 Roughly chop the pecans and dice the apple into 1cm pieces. Set aside. 4. Using an electric mixer at medium speed, cream the butter in a large bowl for 2-3 mins until pale and fluffy. Add the sugar gradually, and mix until fully incorporated. Then beat in the eggs one by one, making sure to beat well between each addition. Mix in the sour cream and vanilla (don’t worry if it looks like the mixture has curdled, this will be fixed in the next step). 5. Add the flour mixture and mix until just incorporated, but with no visible flour. Fold in the apples and pecans. 6. Transfer the mixture to the prepared baking tin(s), and try to spread it out more or less evenly (I found that the batter wasn’t very spreadable, but just do the best you can, and make sure to push it into the corners). Evenly sprinkle the topping over the cake. 7. Bake for about 40 minutes, or until a toothpick inserted into the centre comes out clean. Allow the cake to cool in the tin for 10 mins before either cutting into squares to serve or allowing to cool fully on a wire rack. Despite usually using British words for things (unless I’ve been talking to an American for longer than about 20 minutes) – rubbish, a bin, crisps, chips and scones rather than trash, a trash can, chips, fries and biscuits – I use the words biscuit and cookie interchangeably to describe the same thing. I think I use biscuit more often but sometimes cookie just sounds better. 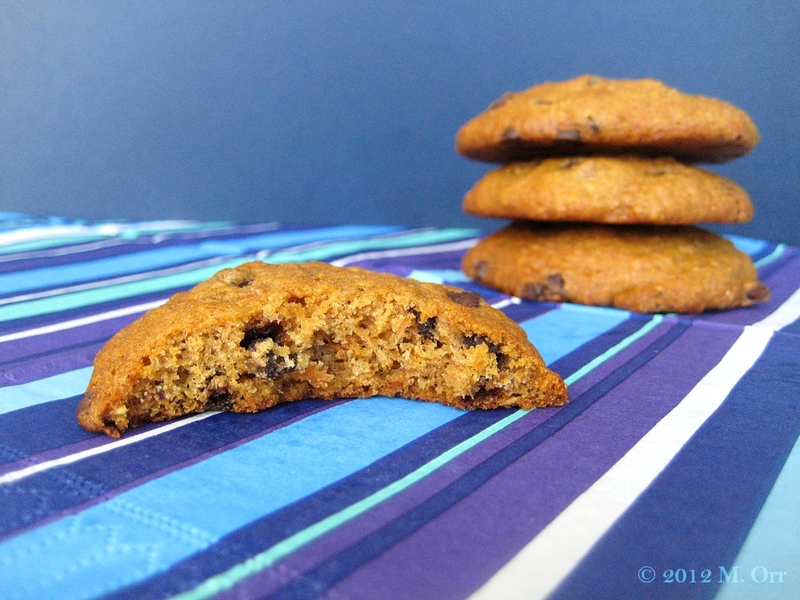 Chocolate chip biscuit really doesn’t have the same ring as chocolate chip cookie. Cookie certainly sounds more appropriate when describing something that I strongly associate with the US… such as peanut butter. Peanut butter biscuits just doesn’t sound right, it’s almost like an oxymoron to sandwich together very American peanut butter and terribly British biscuit. 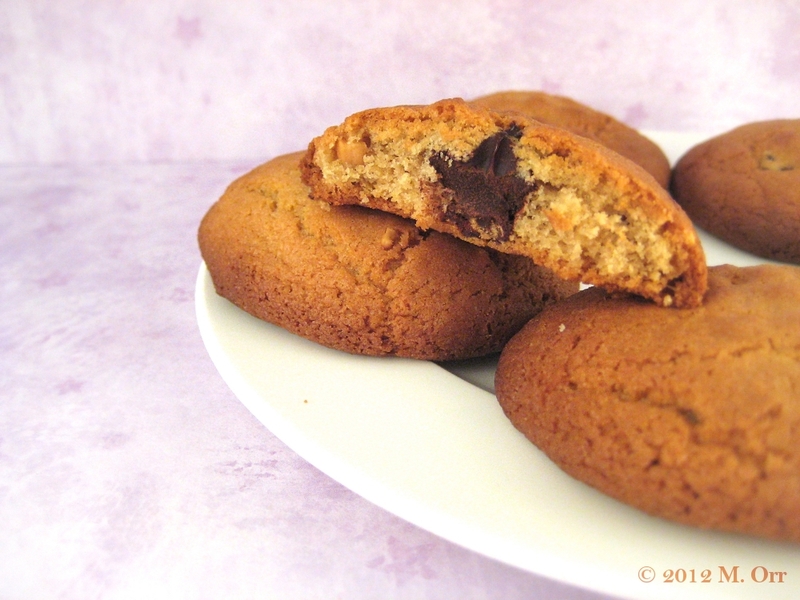 Peanut butter cookies, on the other hand, sound perfect and scrumptious to boot. In case it’s not clear, I love peanut butter cookies. But I don’t have a trusty go-to recipe for them (which is a serious problem in my life, but probably also good for my health). 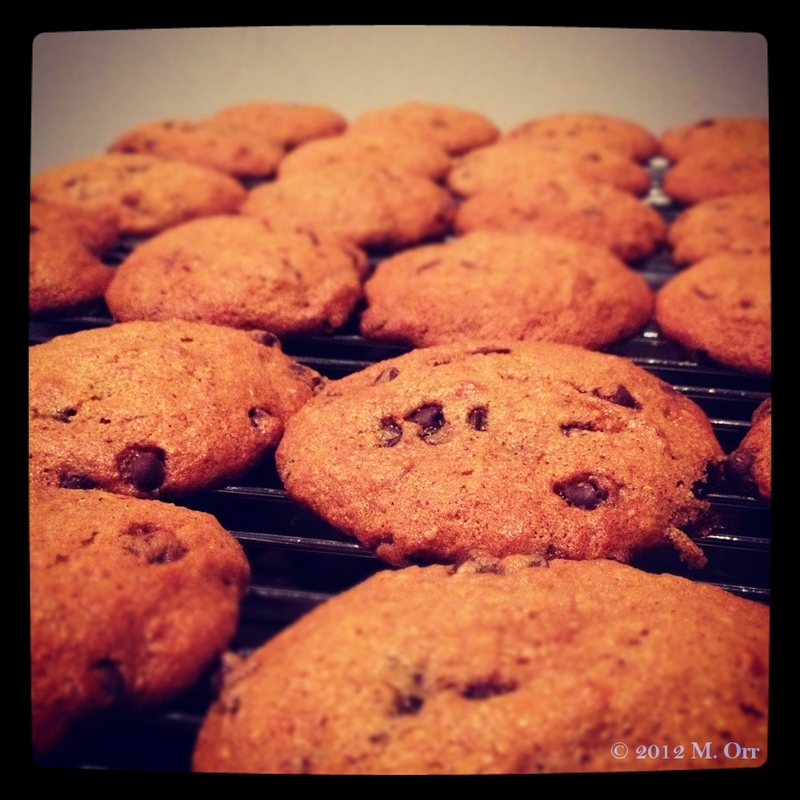 When I saw a recipe for peanut butter chocolate-surprise cookies I just knew I had to try it. I love baked goods with surprises in the middle (like these white chocolate strawberry-surprise muffins), and I love the combination of peanut butter and chocolate so really it was a no-brainer. The cookies ended up a little larger and more spread out than I was expecting, but they were delicious, so I’m not going to complain!! There’s just the perfect amount of peanut butter flavour, they’re not too sweet and the chocolate surprise centre works wonderfully – I initially tried with dark chocolate, but I really think that milk chocolate works better with peanut butter (and I’m not usually a fan of milk chocolate when it comes to baking). 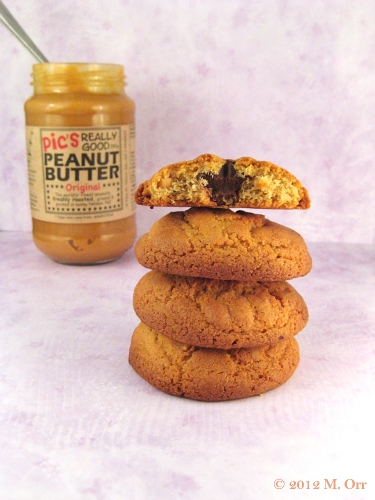 I tried a couple of these without the chocolate centre and they make tasty peanut butter cookies in their own right. 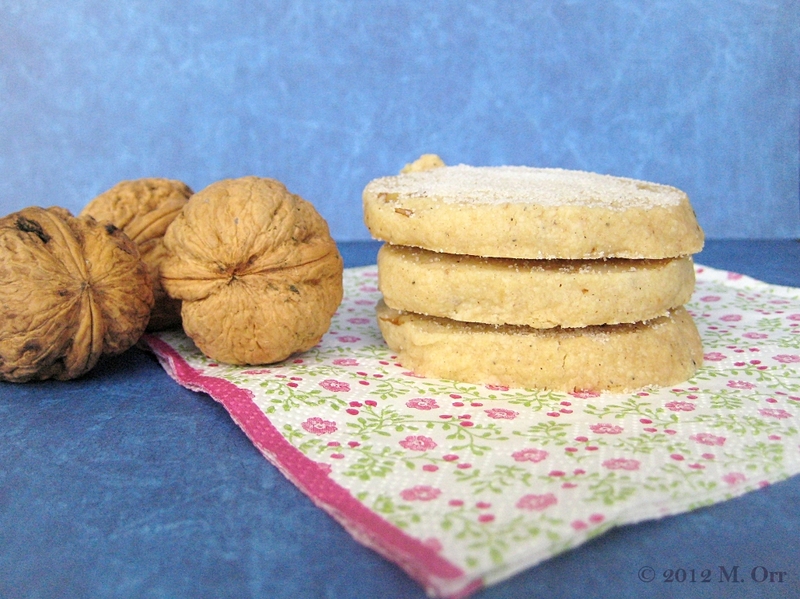 If I’m honest, I won’t be baking them on a regular basis because of the freezing-and-waiting faff (although I did read a whole paper whilst they were doing their thing), but they’ll definitely be making an occasional appearance in situations involving cookies (and people without peanut allergies). 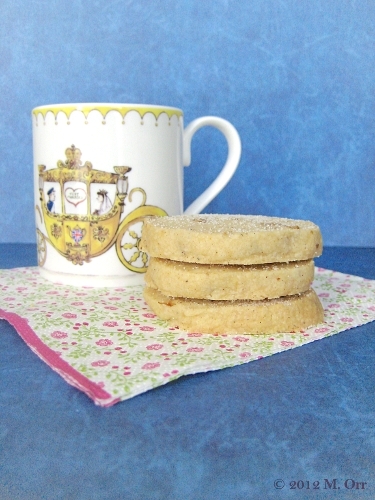 Since these cookies need to stay as cool as possible, I would recommend keeping this recipe for the cooler days of autumn and winter (though Scottish “summers” shouldn’t be too much of an issue…). I used crunchy peanut butter, but smooth peanut butter would work just as well in this recipe, so just use whichever you prefer and have available. If you don’t like the combination of chocolate and peanut butter, these cookies are also delicious without the chocolate centre. The cookies will keep for a couple of days in an airtight container. 1. Mix the flour, baking powder, bicarbonate of soda and salt together in a medium bowl and set aside. 2. Cream together the butter and two sugars together in a large bowl with an electric mixer. Add the peanut butter and egg and mix together on medium speed. When fully incorporated, add the flour a bit at a time, mixing on low speed. 3. Once the mixture is well blended, form the dough into a log with floured hands and wrap in cling film (it gets a bit sticky, even with floured hands, so if necessary, just wrap it in the cling film and form it into a rough log – it doesn’t have to be super neat anyway so don’t worry too much about it). Place in the freezer for an hour. 5. Working quickly to keep the cookies as cold as possible, remove the dough from the freezer and split equally into 12. Press one piece of chocolate into the middle of each piece of dough. Form the dough into a ball around the chocolate and space out on the baking sheet, flattening each one slightly and making a pattern with a fork. If the cookies get too warm and melty, pop them in the freezer for about 5 mins (or the fridge for 10-15 mins if you discover that your baking trays don’t actually fit into your tiny freezer…). 6. Bake for 10-12 mins, allow to cool for a couple of minutes on the baking tray, then transfer to a wire rack to cool fully. I think I’ve turned into a little old lady. I was definitely 23 on Friday, but over the weekend I seem to have fast-forwarded about 45 years and turned 70. As I’m writing this (which, by the time this post publishes itself, means yesterday evening), I’m curled up in a blanket on the sofa, drinking herbal tea (chamomile and spiced apple, no less) and listening to the howling wind and rain lashing the windows. My excuse is that it’s been a cold day. That kind of cold that doesn’t actually feel that bad at first, but that slowly creeps into your bones and camps out there all day, no matter what you do. Spending a good 5h at the aquarium getting splashed by my eagle rays possibly didn’t help (they were being treated for a parasite infection – they didn’t enjoy it too much and made that quite clear, but it had to be done). 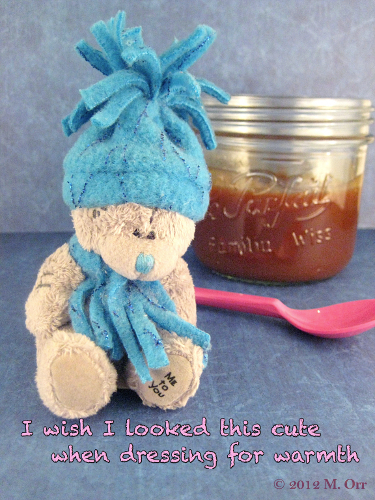 Luckily, I had some utterly divine salted caramel sauce waiting for me at home. Before surrendering myself to my blanket-and-sofa situation, I sautéed up some apples and drizzled them with the caramel. They didn’t quite solve the cold-in-my-bones issue, but they tasted heavenly. So good that I may or may not have guzzled them all up before I remembered to take a photo… Woops. 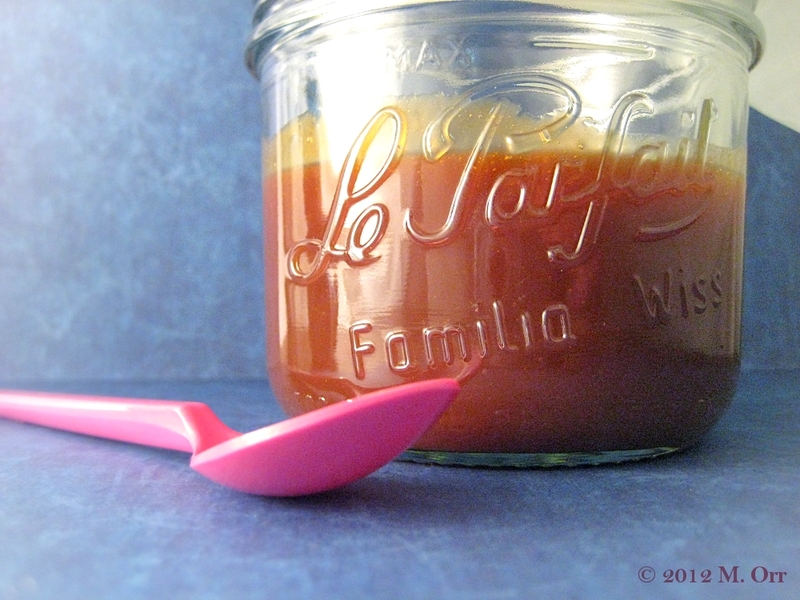 Caramel sauce is a fairly basic thing to have in your cooking repertoire, but I’d actually never tried making any until a few of weeks ago. Not because I was scared, but it just never came up as something I needed for a recipe or dessert. I can’t even remember why I decided that I was going to make caramel sauce, but uhm, my first attempt didn’t really work (luckily it wasn’t a life or death situation). At all. And nor did my second. I don’t tend to deal very well with kitchen failures, much less two in a row, especially when I don’t know what I did wrong. 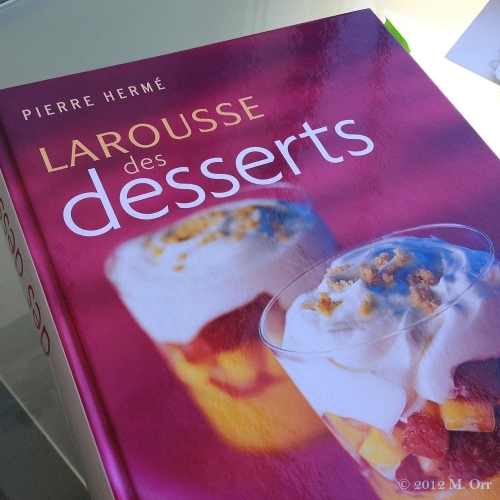 I’d chosen the recipe from Pierre Hermé’s Larousse des desserts, a book which I tend to consider the bible of such things and which has never let me down before. Caramel sauce isn’t supposed to be difficult either, and I’ve managed recipes with the full three whisks of difficulty, and this one only had two, so what was wrong with me? 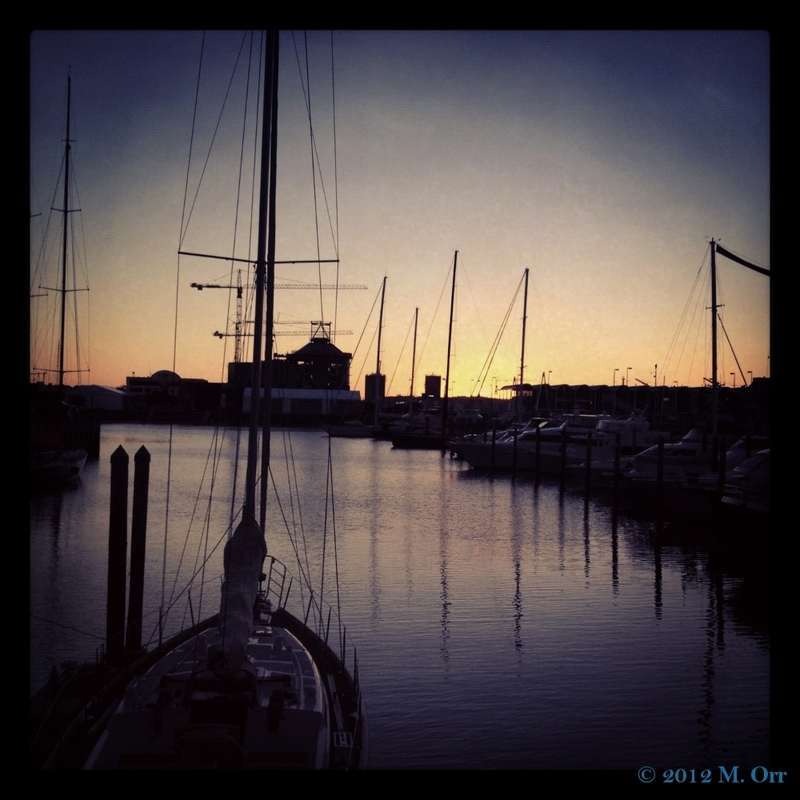 Was I a doomed caramel failure? 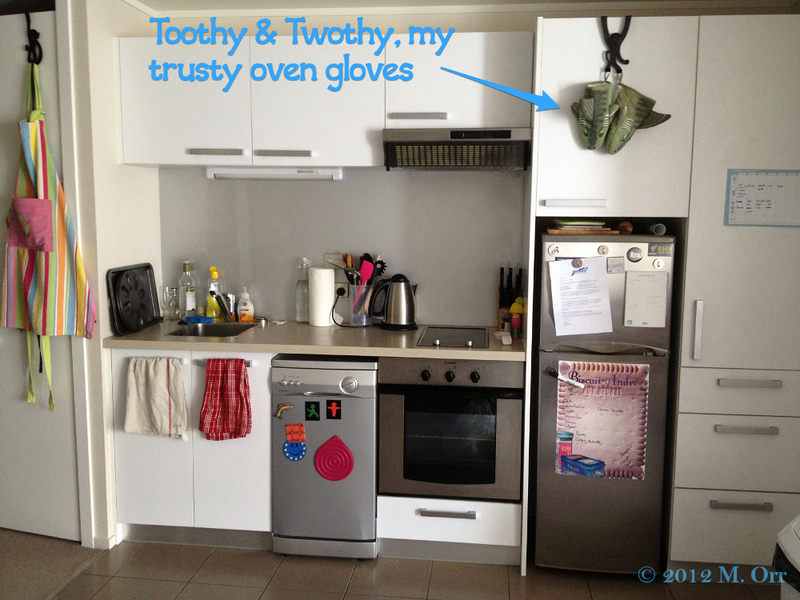 Had I lost my ability to cook without noticing? Would I ever regain it? (When a recipe goes wrong sometimes I stay zen, but usually I start to assume that I’ve magically lost all my cooking/baking abilities.) So I turned to Mr Google and happened across this and this by David Lebovitz, which I found informative and reassuring because I felt like I had a better idea of the process of what I was trying to do. I also found a few alternative recipes. The downfall of the Larousse recipe was that it gave limited indication of what to look for: “place sugar in saucepan, heat a little, moisten with some of the water, cook until amber, then add the rest of the water and boil on a higher heat until it’s a good colour.” That’s the actual recipe… and having never made caramel, it didn’t really give me enough to go on. I ended up with a crusty mass of sugar at the bottom of the saucepan instead of caramel. Twice. I was so elated when my attempt with a new recipe actually worked that I let it cook for slightly too long and burnt it. Thankfully, my fourth attempt was a success! To sterilise a glass jar, wash the jars and lids in hot, soapy water before placing on a baking tray and drying in an oven pre-heated to 110°C (about 10 mins or so). Once fully dried, remove from the oven and allow to cool fully before using. Remember that you’re working with very hot sugar – an apron and long sleeves are recommended in case of any splattering (even if you don’t usually cook with an apron, this is a good time to make an exception). Oven gloves are probably a good idea, too. By adding half the salt once the caramel is cooled, you ensure that it doesn’t all melt into the caramel, leaving little bursts of salty flavour. Freshly ground salt is best as it tends to be a little coarser than already-ground table salt, so it adds that little intensity of flavour – you could use fleur de sel, but I think it might add a little too much saltiness. The sauce will keep in a sealed jar for a couple of weeks in the fridge. If you’re unsure of any of the steps, refer to the photo guide at the end of the recipe. 1. 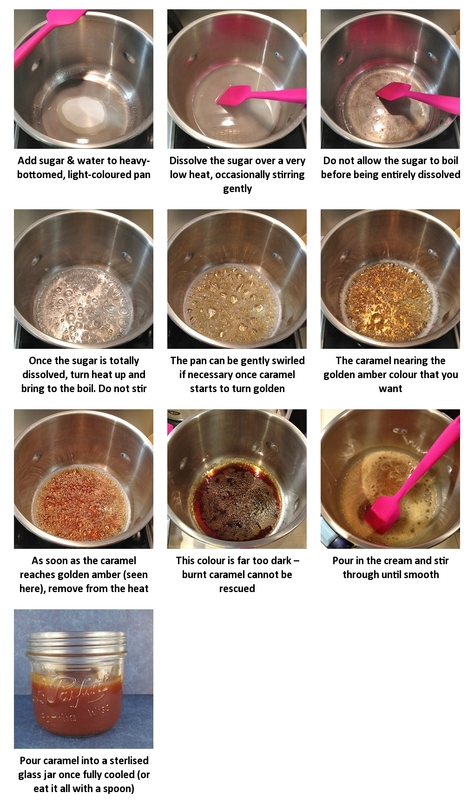 Place the sugar and water in a large heavy-bottomed pan (avoid using non-stick if you can – I’ve read that the elevated temperatures that hot sugar can reach aren’t good for non-stick materials – and use a light-coloured pan if possible, so that you can see the colour of the caramel). Heat over a very low heat, gently stirring occasionally (make sure to use a utensil that can withstand very high temperatures – a wooden spoon is perfect, but avoid anything plastic, and only use silicone utensils if you are 100% sure about them) until the sugar is entirely dissolved. Do not allow to boil at any point. 2. Once the sugar is entirely dissolved, turn the heat up and bring the sugar mixture to the boil. Do not stir. Once the sugar mixture starts to turn golden, you can gently swirl the pan around if necessary. As the sugar is boiling, measure out the cream and make sure it’s ready to use as soon as required. 3. The sugar will continue to darken – keep an eye on it, it can turn quickly, and it can’t be rescued once burnt. Once it has reached a golden amber colour remove from the heat and immediately pour the cream through a metal sieve and stir until smooth (using a sieve is optional but it should stop the caramel from splattering over you – obviously make sure). Stir through half the salt and allow to cool. 4. 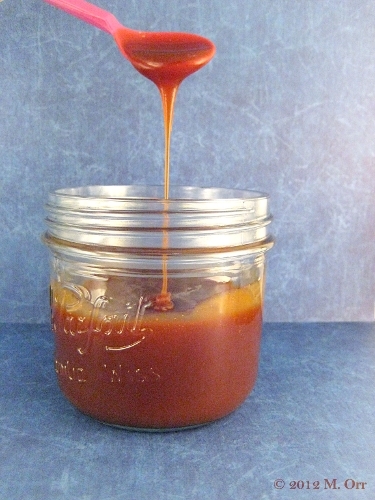 Once cooled, stir in the remaining salt and pour the caramel into a sterilised glass jar. Serve at room temperature or warmed (you can warm it in the microwave at a low power). Store in the fridge.